As a volunteer in Archives and Manuscript Collections, Matthew Fellion has been listing the records of the North East Fife Conservative and Unionist Association (NEFCUA), which the Library acquired in autumn 2017. Acc.13853 is part of the Library’s modern political manuscript holdings, which include records of Scottish political parties, politicians, and trade unions. In this post Matthew tells the story of the ‘Fight for Fife’, a crucial moment in Fife’s political history that is reflected in the archive. 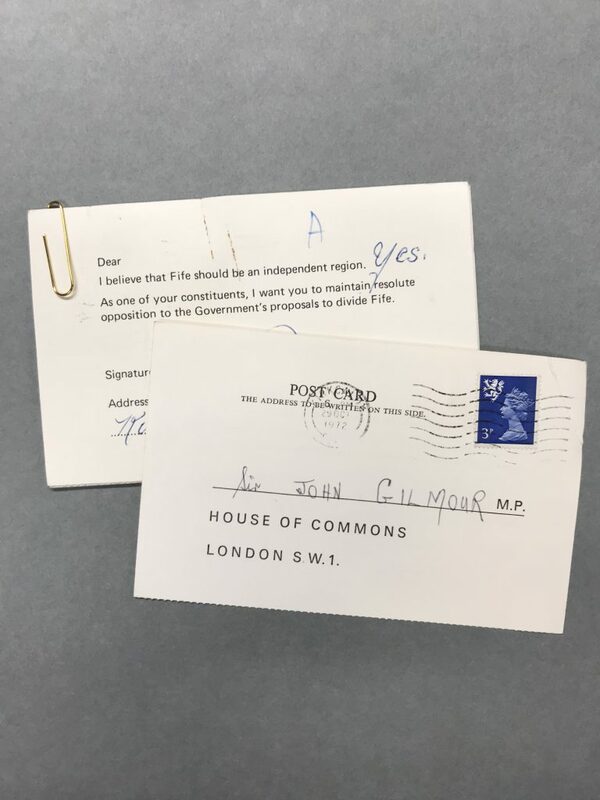 Sir John E. Gilmour, Conservative MP for East Fife from 1961 to 1979, is a strong centre of gravity in the NEFCUA accession. His constituency correspondence has been collected extensively, and he features in many of the association’s albums of press cuttings. His political activities exemplify a form of local Scottish conservatism that was not always in step with the Conservative Party. From the backbenches Gilmour tried and failed to convince Edward Heath’s government to save the sugar beet factory near Cupar, which the British Sugar Corporation shut down by early 1972. Gilmour was more successful in the ‘Fight for Fife’, a campaign that united Fifers across political lines when the government threatened to split the county in two. It might seem sacrilege to divide the ancient and physically well-defined Kingdom, but the evidence convinces us that the time has come for this to be done. With the bridging by road of the Tay and the Forth, these estuaries are no longer the barriers they once were. Dundee provides the regional centre for north Fife, just as Edinburgh does for south Fife. There is no comparable centre within the county itself. Just where the boundary should be drawn through Fife is a matter of some difficulty, but in broad terms the dividing line between the Dundee and the Edinburgh areas of influence corresponds with the divide between the agricultural north and the industrial south and west of the county. It is true that geography and tradition have until lately given the county an unchallenged unity; but the Commission rightly took note of recent developments which significantly alter the picture. With improved communications the links between the northern part of Fife and the rest of Tayside have become clearer, as have those between south Fife, with its expanding industries, and the Lothians. It has become evident that for the Tay estuary (and also for the Forth) there should be a single regional authority responsible for major planning, involving economic strategy, allocation of land use, and transportation. What foreign invaders could never do, what ancient feuding could never do, now seems to have been brought about by a bevy of pin-sticking, card shuffling, crystal-gazing civil servants in that veritable Teahouse of the August Buffoons—St Andrew’s House. They seem to have won the day and must be laughing up their sleeves at the scant attention paid by the Government to the protests which came from the grass roots of local government in Fife. 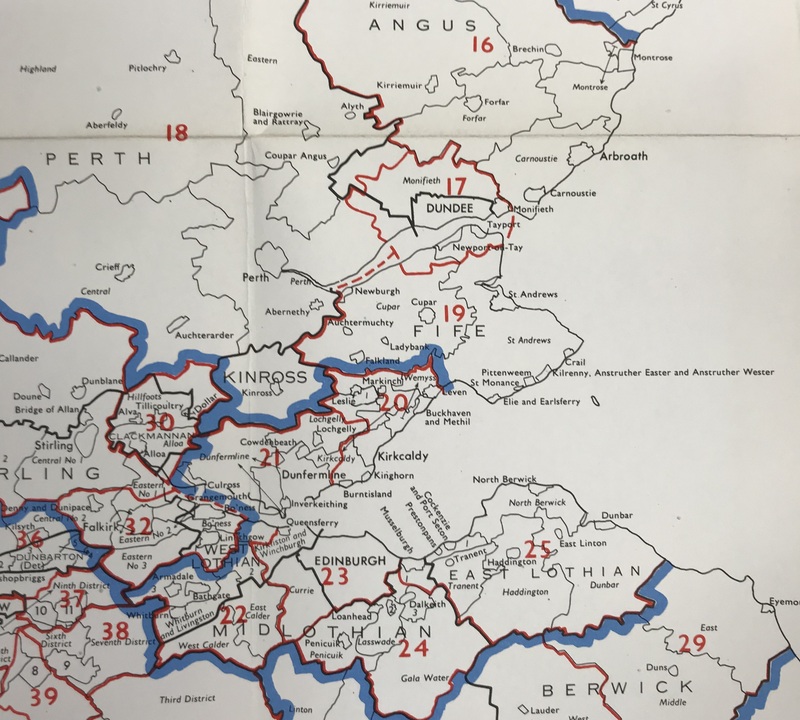 The widespread, non-partisan campaign to make Fife its own region, which rallied around slogans such as ‘Fight for Fife’ and ‘Keep the Kingdom’, was both emotional and practical, expressing a deep sense of regional self-reliance. Although Fife’s designation as an ‘ancient kingdom’ reflects the county’s special status in Scottish history more than any governing structure that it can be shown to have had, this ‘Kingdom without a King’, in Æ. J. G. Mackay’s phrase, took the proposed displacement of its local government as an existential threat. Fife County Council, consisting of Labour, SNP, Communist, and Independent councillors, opposed the plan, writing an open letter to Gordon Campbell, Secretary of State for Scotland. ‘Fife has the will, the skill and the adequate financial resources to best ensure the future prosperity of its own people’, they wrote. 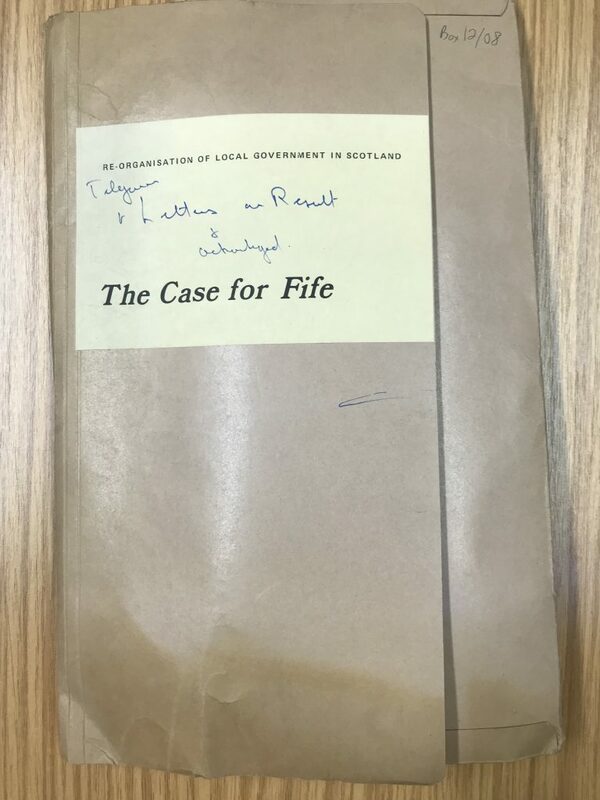 In 1972 the council published a booklet by County Clerk James M. Dunlop entitled Fight for Fife. Dunlop argued for the economic viability of Fife and its efficiency as a unit of local administration, and pointed to the proposed Borders region, which with a population of 96,000 and no large urban centres flouted the criteria under which Fife (population 325,000) had been disqualified. What annoys my constituents is that they have never had a proper answer when they have asked why it is proposed to divide up the county of Fife. It has never been said that it is essential in the interests of the people of Fife since it will give them better and more efficient local government. If my hon. Friend can say that, the expenses will come down, and that everyone will be happier, I am sure that most people will accept the proposal. But that is the last thing that my hon. Friend says. All that we get from him is that people must see an architect in Edinburgh or in Dundee. Gilmour promised to deal with the question further when the bill was in committee and warned that he would withhold his support at third reading if Fife were not given regional status. When the bill came before the First Scottish Standing Committee, Gilmour put forward an amendment to delete the language in the bill that would place north-east Fife in Tayside. After several hours of debate, spread over three sessions, the committee accepted Gilmour’s amendment by a narrow margin of thirteen votes to ten. The Secretary of State respected the decision of the committee, and when the legislation took effect in 1975 Fife became a region. A file in the NEFCUA’s records, labelled ‘Re-Organisation of Local Government in Scotland: The Case for Fife’, contains letters, cards, and telegrams urging Gilmour to oppose the division of Fife and congratulating him when he had succeeded. There are nods from political opponents, such as the secretary of Levenmouth Trades Council, who, though he acknowledges he will criticize Gilmour again in future, thanks him for his efforts. There is a telegram from the East Fife Conservative Association, as the NEFCUA was then called, along with missives from provosts and local councillors, professors, ministers, pupils, a headmaster, a teacher, a town clerk, a constable, a shipmaster, a trade union member, the North Edinburgh Conservative candidate Alex Fletcher, as well as representatives of the Fife County Scout Council, Fife Girl Guides, the St Andrews Women Citizens’ Association, Scottish Women’s Rural Institutes, National Council of Women of Great Britain, Kelty Co-operative Men’s Guild, East Fife Hospitals Board of Management, Fife Tourist Association, Fife Herald Group, the Central Fife SNP constituency association, and local businesses. All the country between the Forth and the Tay grows narrow like a wedge eastward, even to the sea, and it is called Fife, a district provided within its own bounds with all things necessary for the use of life. U.K. Government documents cited in this post can be accessed through the licensed digital collection U.K. Parliamentary Papers. Report of the Royal Commission on Local Government in Scotland 1966-1969 (Cmnd 4150, 1969) para 750. 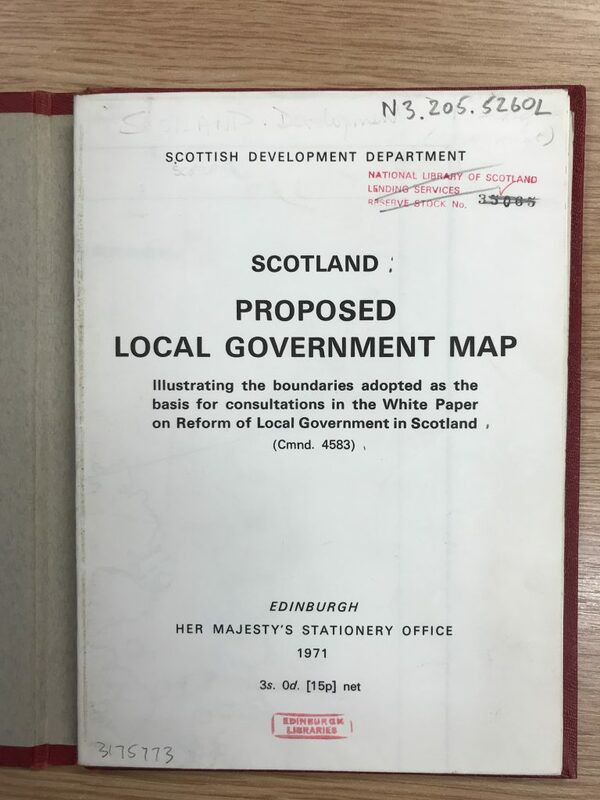 Reform of Local Government in Scotland (Cmnd 4583, 1971) para 48. 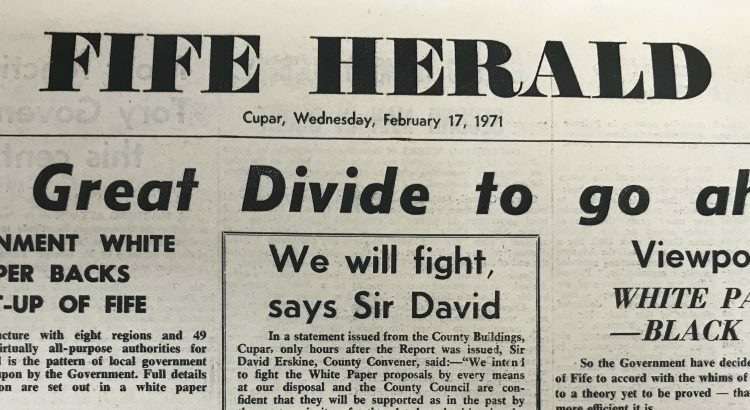 ‘White Paper—Black Day’, Fife Herald, 17 February 1971. Æ. J. G. MacKay, The History of Fife and Kinross (Edinburgh, 1896), p. 264. For an analysis of Fife’s claim to being an ancient kingdom, see Bruce Manson, Fife: Why a Kingdom? (Glenrothes: Fife Council, 2010). ‘All-Party Letter Says “Don’t Split Fife”’, Fife Herald, 24 November 1971. HC Deb 4 December 1972 vol 847 c961. George Buchanan, History of Scotland (1582), qtd. in MacKay, p. ii.